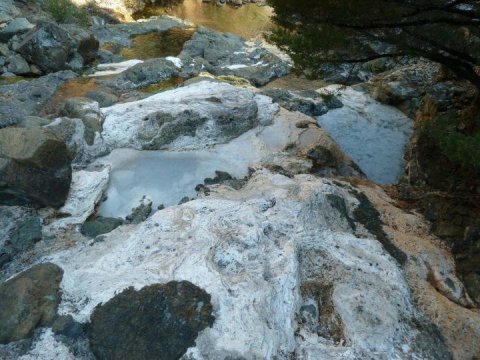 A team of scientists report in a new study that they have found evidence of hardy, methane-producing microbes in a fresh water spring. Previously methane-producing microbes that feed off chemical reactions between water and rock were found in vents deep on the ocean floor. The scientists are now confirming the evidence of this process has been found on land in a freshwater spring in California. The team’s research paper has been published in the Journal of Geophysical Research: Biogeosciences, a journal of the American Geophysical Union. The methane-producing microbes were found in water that surfaces from deep underground at The Cedars, a set of freshwater springs in Sonoma County. It is the first time scientists have proven that these kinds of methane-producing microbes, which thrive in harsh environments, live anywhere outside of the deep sea. The new finding could offer clues into how early microbes could have lived on Earth billions of years ago and if they might be present on other planets like Mars, according to scientists in the field. The Cedars, shown here, is a small, isolated set of springs flowing out of a large patch of red rock from Earth’s mantle in Sonoma County, California. The Cedars is one of the few easily-accessible sites of serpentinization on land. Scientists report in a new study that they have found evidence of hardy, methane-producing microbes in water that surfaces from deep underground at The Cedars. Image Credit: Lukas Kohl, AGU. Click image for the largest view here. Much larger view at the press release link above. T Lukas Kohl, a biogeochemist at Memorial University of Newfoundland in St. John’s, Newfoundland and lead author of the new study said the study also shows the newly-discovered microbes are likely capable of using carbon dioxide to produce methane – a finding that could have implications for future carbon sequestration projects being proposed in areas similar to The Cedars. If the microbes convert carbon dioxide injected into the ground into methane – a potent greenhouse gas – it could offset the benefit gained by carbon sequestration, he said. The research could also aid efforts to recycle carbon dioxide back into fuel. Serpentinization, a process where water reacts with rock to create a green stone called serpentine, is common on the ocean floor. In the process, byproducts of the reaction, including methane, hydrogen, and heat, are released. The Cedars, a small, isolated set of springs flowing out of a large patch of red rock from Earth’s mantle, is one of the few easily-accessible sites of serpentinization on land. Communities of microbes have been detected at many serpentinization sites across the globe, including in oceanic vents and sites deep underground. These harsh, high-pH environments have few organic molecules for organisms to feed on. These hardy microbes likely use the byproducts of serpentinization as an energy source, according to the study’s authors. Until the new study, however, the only sites known to host microbes that released methane as a waste product were deep underwater, Schrenk said. Previous analysis of water from The Cedars suggested some of the methane found in the springs could have come from microbes. To confirm the microbes could produce the methane at The Cedars, the study’s authors took water samples from the springs and exposed the samples to different conditions in the laboratory. The new findings also suggest the microbes can convert carbon dioxide into methane. Some scientists have proposed injecting carbon dioxide from the air into rocks like those at The Cedars. The carbon dioxide interacts with the rock and water to form a solid carbonate that can sequester carbon underground indefinitely and keep it out of the air. But if the microbes convert the injected carbon dioxide to methane and release it into the atmosphere, it would defeat the purpose of sequestration, Schrenk said. “If some of that [sequestered] carbon dioxide is converted to an even more potent greenhouse gas, we’re really in trouble,” he said. The new study also sheds light on how microbes could have used the energy and chemicals from serpentinization to survive on early Earth when the atmosphere contained less oxygen and fewer organic molecules, said William Brazelton, an astrobiologist at the University of Utah in Salt Lake City who was not involved with the study. Further, the methane they released could have had an impact on the environment and the Earth’s evolution, he added. For some of us the discovery adds hope to mankind joining in to participate in the planet’s carbon cycle. Humans run through a lot of carbon and generally dump it into the atmosphere. More tools to recycle the carbon dioxide are going to be welcome and these microbe’s genetic codes are going to be useful in that task.